Edgewood’s Easter Party will be held Saturday, April 20th from 10 to 11 am at the Edgewood Convalescent Home. Visit with the Easter Bunny. Games and activities for the kids. 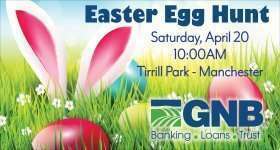 Easter Egg Hunt weather-permitting at 10:40 am.